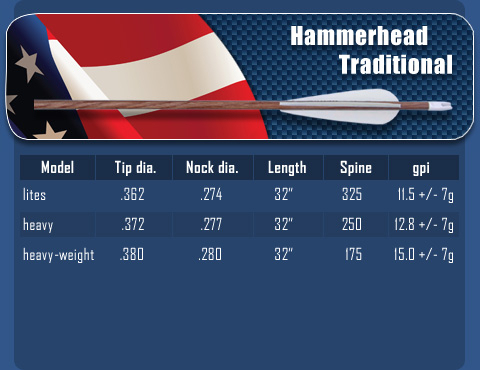 The Hammerhead Traditional is Arrow Dynamics' newest shaft for the Traditional shooters. The Hammerhead utilizes built-in FOC. The shaft has 2x the wall thickness up front for 11inches for perfect balance and extra toughness for the big game or stump-shooter. Made in USA! Arrow SHAFTS only. Prices include components and shaft. Copyright © 2011-2019 Arrow Dynamics. All Rights Reserved.